The Metropolitan Transit Authority of Harris County (METRO) is the region’s largest public transit provider, offering safe, reliable and affordable transportation services about 370,000 times per day. Besides operating more than 1,200 buses, METRO is currently expanding its 7.5-mile light-rail line (Red Line), with three new lines under construction. 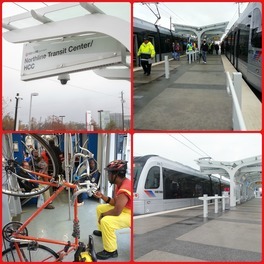 METRO’s services also include: Star Vanpool, METROLift, HOV lanes, HOT lanes, Bikes-on-Buses/Trains program, Park & Ride, and road improvement projects. Learn more about METRO services at ridemetro.org where you will also find information about our T.R.I.P. app and the new digital, interactive rider tool METRO 360 [take a seat]. If you build it, they will come. And, they did. The community came out in full force on Saturday, Dec. 21, to celebrate the opening of METRO's Red Line extension despite scattered showers throughout the day. Doors opened to passengers at 10 a.m. sharp and seats filled up quickly. METRO registered 22,054 boardings for the free-ride day for the entire Red Line, which includes the existing 7.5-mile section and the 5.3-mile extension. The newly-opened extension recorded 4,500 boardings for Day 1 of service. Average Saturday boardings in December 2012 were 13,800. 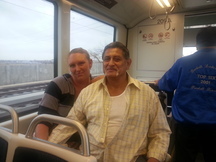 Rufus Hernandez and wife Shannon (pictured left) traveled all the way from Galveston, Tx to ride the Red Line. Hernandez lived in the city's Northside 30 years ago and was amazed at the changes his former neighborhood had undergone. METRO hosted ceremonial events at the starting point of the North Line and at the end of the line. U.S. 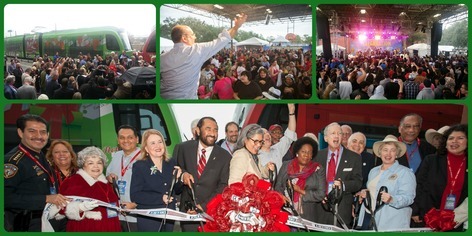 Congressman Gene Green, who represents the 29th District, home of the North Line, cut a ribbon and smashed a champagne bottle over the holiday-decked out train at the last station stop, Northline Transit Center/HCC. More elected officials gathered at the start of the North Line, UH-Downtown station, where they boarded the Polar Express wrapped train to mark the expansion milestone. The inaugural bash culminated with snow, food, activities and lots of music at Moody Park, which included Mango Punch, Fama, Tamar Davis and A.B. 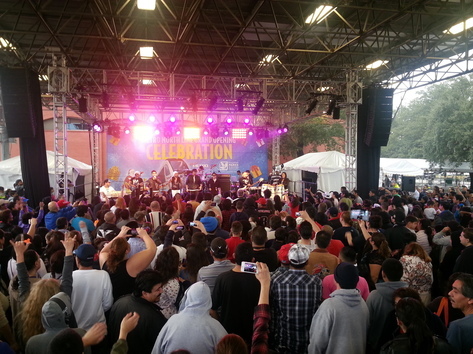 Quintanilla III y los Kumbia King All Starz. The North Line’s inauguration arrived just in time for the holidays, and with another celebration around the corner for the agency – METRO’s 10 year anniversary of the existing Red Line, which opened its doors on January 1, 2004. METRO’s light rail system will triple in size in 2014 when the East End (Green) and Southeast (Purple) lines open to the public. For more information on METRO’s rail expansion project, click here.